-To reduce the prevalence of malnutrition among children under 5 in target areas. -To reduce water borne disease especially diarrhea in target areas. As a result, we found that community has more access to Nutrition health service and more knowledge about health Education of Nutrition, 1000 days of IYCF communication. As a part of field health worker capacity, the field nutrition staffs received knowledge and qualified skill from Nutrition program activities and the project management skill also improved both central and field. Moreover, community health education access were expend more and mother were became more aware and understanding how to take care of their children from not getting malnutrition, share their knowledge to their friends and neighbors. The detail activities of project outcomes are mention in below table. The regular activities such as Moderate malnourished children – supplementary for feeding will be distributed in every 2 week at VTHC and monitor nutritional status by MUAC will be conducted. Severely malnourished children – In-patient management service also will be treated at VTHC and, monitor nutritional status by MUAC and community Health Education will be regularly provided. Targeted communities get more access to WASH health service and support. Further, they gain more knowledge about hygiene, village sanitation and the benefit of using latrine on WASH health Education. As community getting more knowledge, they were mostly prevented from water borne diseases. Furthermore, their hygiene practice were improve and household sanitation getting better. KDHW Nutrition Program cooperates with other partners, district leaders, Clinic in charge, field health workers and villages’ stakeholders to implement program activities. Regarding the selection of program worker, district health and clinic in charges select relevant health workers for Nutrition. As long term nutrition improvement, KDHW nutrition program Team will coordinate closely with other stakeholders such as KORD, CIDKP and live-stocks sector. KDHW WASH Program cooperates with other partners, district leaders, Clinic in charge, field health workers and villages’ stakeholders to implement program activities. c) The economic barriers for beneficiaries to adopt new practices and the economic impact of these practices can be discussed here as well. As local Nutrition Field Health Workers received skills and knowledge about nutrition and they will be able to undertake and manage malnourished children in the future. Further, community also gradually will change their behavior regarding nutrition. Agriculture knowledge and skills need to be improved and provided to the community. Hence, nutrition team and, agriculture and live – stocks sector are importantly need to be cooperated together in order to find a better solution for the long term sustainable nutrition issue. If community received knowledge and skill about agriculture, they will be able to manage agriculture it be benefited to their regular income both for their family and community. As our field workers conducted WASH awareness raising training to community, the community got knowledge and can practice the hygiene method as needed. But in some community, using latrine is the new practice for them and difficult for them to use it and maintain it. In some place, even we provide latrine materials; the transportation is difficult for them. Worldwide, undernutrition contributes to about one third of the 24,000 deaths of children under five that occur daily. In eastern Burma, food insecurity and aggravating health factors such as intestinal worms, respiratory infections and malaria are catalysts for malnourishment, contributing to the under-five death rate of 138 per thousand. Children under five are at risk for malnutrition. Screening for malnutrition in small children is based on mid-upper arm circumference (MUAC). A circumference of 110 mm or less indicates severe malnourishment. A circumference of 111 to 125 mm indicates moderate malnourishment. A randomized cluster survey of 5754 households in eastern Burma in 2008 found a global acute malnutrition rate (combined severe and moderate malnutrition rates for children under 5) of 12.6%. According to the WHO Standing Committee on Nutrition, a global acute malnutrition rate over 10% qualifies as a serious humanitarian emergency requiring action. Recommended actions include community-based programs for managing malnutrition. In 2008, with technical assistance from the Global Health Access Program (GHAP), KDHW initiated a malnutrition intervention for children under five years old. The initial training of Nutrition Program (NP)* health workers included nutrition theory, malnutrition screening of children under five, and targeted feeding practices. The NP health workers are given biannual refresher trainings. Through 2010, eight health workers had completed five trainings, eight health workers had completed four trainings, and three had completed two trainings. The program was introduced at two mobile health clinics in December, 2008. It was extended to one more clinic in July, 2009, and to a fourth clinic in July 2010. These four clinics in the NP also are in the immunization program. The NP was introduced as well at two other clinics, where, like the Immunization Program, it later was suspended because of military incursions. Following a baseline survey at each clinic, program health workers conduct bi-annual under-five screening using MUAC. Through 2010, six screenings had been conducted at the first two clinics, five at the third clinic, and two at the fourth clinic. 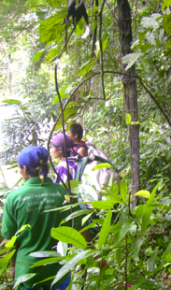 Two screenings were conducted in a fifth program area before the villagers fled fighting between the SPDC and DKBA in June, 2009. A third screening was done of those villagers in September, 2009 in two refugee camps, but no further screening was possible following the villagers’ forced repatriation. The program was resumed at the clinic in 2012, however, and screening has begun. Following each biannual screening, the clinic workers distribute weekly food supplements to the families of moderately malnourished children (MUAC 110-125mm), providing an extra 1,000 cal/day in accordance with dry-ration guidelines. The supplements include rice flour, powdered milk, sugar, and vegetable oil. The workers also provide education to the families on food preparation and storage, and on the importance of encouraging their malnourished children to finish their meals. 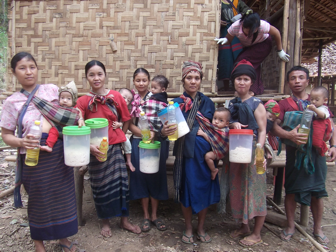 Severely malnourished children (MUAC <110 mm) are treated with high-energy milk in the clinics, in accordance with the Burmese Border Guidelines. The children must stay at the clinic until they improve to being only moderately malnourished. On average, severely malnourished children transition to being moderately malnourished after about two weeks and then can return home, where they continue to receive supplements for moderate malnourishment. After one month they are re-examined to ensure that they still are not severely malnourished. Moderately malnourished children are discharged from the program when their MUAC exceeds 125 mm. On average it takes about eight weeks of targeted feeding for a moderately malnourished child to be discharged. The longest period of targeted feeding until being discharged, for two children, was six months. During the first two years, all children who have remained to be treated in the program, whether severely or moderately malnourished, have been discharged and have remained adequately nourished when evaluated a month after discharge. Recovery from malnourishment for treated children is only a matter of time. Results of screening for the first two years of the program are given in the table below. The overall decline of about 50% in prevalence of acute malnutrition in the screened portions of the population from the first to the second year of the program suggests that the program is having a positive impact. Since the samples screened were not random, however, we do not evaluate the significance of the decline. KDHW hopes in the future to be able to expand program coverage to more remote clinic areas. *The Nutrition Program (NP) was formerly named Targeted Feeding Program (TFP).